April is a great time for a walk in the park, eating good food, listening to music and viewing the efforts of some of the Southwest’s best professional artists. 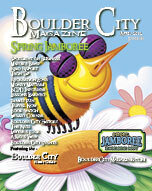 You can do just that on April 21st and 22nd when the Boulder City Art Guild will present the 27th edition of their Fine Arts Festival. Over 100 artisans have signed up for the show. “It is a unique opportunity to view the latest works of a select group of talented individuals and you won’t have to walk miles to view everything!” states show chairman, Diana Meyers. The show will be held at the Bicentennial Park directly behind city hall and across from the Bureau of Reclamation’s Government Park. This year the show will feature three exceptional artists. 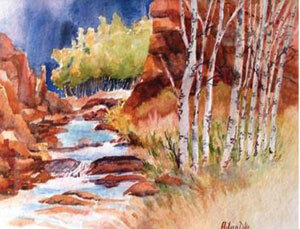 Outstanding two-dimensional artist, Aileen Dike, has won many awards for her watercolors. She will be displaying her work in booth 8. Kathy Burks, featured photographer from Fernley, Nevada will be showing in booth 26. 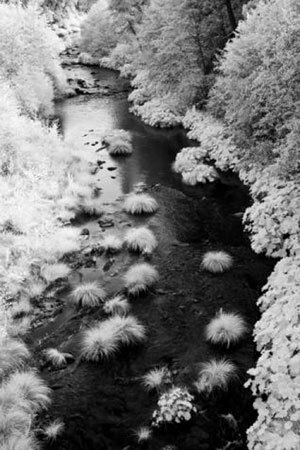 Her specialty is infra-red scenic photography. The third featured artist is crowd pleasing three-dimensional artist, Shannon Macklin, who works with driftwood, water and copper. Shannon travels from Flagstaff, Arizona and will be displaying his work in booth 90 and 91. Representatives from the BC Art Center will be present showing the many skills of the young local talents. Participating artists will be demonstrating how they achieve their work plus the talented local vocalist, Mike Miele, will be performing at 12:00pm and 2:00pm each day during the show. A raffle, with proceeds going toward scholarships, will be held and drawings for artists’ donation work will take place every hour both days. Easy listening vocals, good food, lots of interesting displays and free stuff all add up to a great day for a walk in the park.